It insisted that Dogara must step aside for independent investigation to be carried out in the allegations of budget padding against him or be forced out of office. 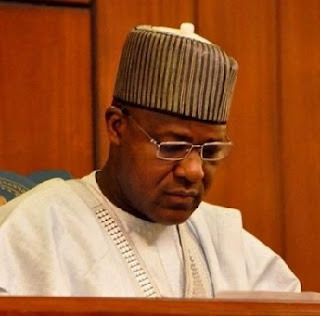 Dogara had, on Friday, dismissed calls for his resignation after a meeting with President Muhammadu Buhari at the State House, saying there was nothing like padding in the legislature. In a statement jointly signed on behalf of the Transparency Group by Hon. Bashir Baballe, member representing Ungogo/ Minjibir Federal Constituency of Kano State; Hon. Agunsoye Oluwarotimi Ojo, member representing Kosofe Federal Constituency of Lagos State; and Hon. Abubakar Chika Adamu, member representing Shiroro/Munya/Rafi Federal Constituency of Niger State, the group asked the speaker to resign honourably. “We hereby reiterate our call on Rt. Hon. Yakubu Dogara to resign before we start exposing the sleaze and corruption surrounding the internal budget of the House,” the group stated. The three lawmakers said they released the statement “on behalf of the 206 members of Transparency Group,” although names of the other 203 members of the group were not disclosed. According to the lawmakers, Dogara should immediately step down for proper investigation or new allegations would be unearthed to ultimately force his hands. Also yesterday, leader of the Transparency Group, Hon. Mohammed Musa Soba (APC, Kaduna), in an interview with New Telegraph, accused Dogara of fraudulently earmarking more than N3 billion for projects sited in his constituency, an action he said bordered on criminality. “The general public should note that Speaker Dogara made criminal insertions (otherwise known as budget padding) to the tune of over N3 billion to his constituency alone. “While the entire zonal intervention for the three senatorial districts of Bauchi State and 12 federal constituencies in the state amounts to N1,666,666,666, the Speaker criminally inserted about 200 per cent of the amount, totalling N3,079,000,000 to his constituency alone,” the group said. It equally alleged that N950 million purportedly meant for empowerment schemes was also diverted by the speaker. It is, however, contradictory that while the Transparency Group claims to have 206 signatures, the speaker has reportedly garnered 262 signatures bringing the total to 468, whereas the House is composed of 360 members only. Namdas hinged his position on the fact that the allegations against Dogara have not been proven before any competent court of law. He also dismissed the 206 lawmakers purported to be members of the Transparency Group calling on Dogara to resign, daring them to remove the speaker if they have the numbers. Dismissing the 206 signatures allegedly garnered by Transparency Group to impeach Dogara should he refuse to resign, Namdas said: “I believe that even the numbers of lawmakers’ signatures they are alleging that they have generated are not there. I’m sure they don’t even have the numbers. “Thirdly, if people are talking about transparency and have forgotten that part of transparency is the doctrine of fair hearing, then it is unfortunate. Transparency also means allowing the other party fair hearing to make his defence. So, if someone has submitted a petition, it is only natural that the person being accused be allowed to also present his own side of the story. Meanwhile, barely four days after the All Progressives Congress (APC) asked him to cease fire, former chairman of the Appropriation Committee,Hon. Abdulmumin Jibrin, yesterday broke his silence, insisting that the Speaker must reconvene the House immediately. In a statement issued last night in Abuja, Jibrin alleged that there was plan to kill him and that he has since briefed his lawyers on the matter. “I no longer feel safe. I have carefully followed their desperation to suppress what will go down in history as the biggest corruption case in Nigeria. I have prepared myself for any eventuality. I have spoken to my mum and dad extensively during the weekend. “I have prepared my family. I have handed over a handwritten note and documents to a popular SAN, a man of integrity and other persons that I believe will lay it bare even if they succeed in killing me,” he said. “In doing so, they mischievously expanded the scope of the culpability to give an impression that the entire House, Senate and even the executive arm of government and some individuals outside NASSare on trial,” he noted. He pleaded with all former Heads of State and the diplomatic community, particularly Ambassador of the United States of America, High Commissioner of the United Kingdom, the German and French Ambassadors to call on Dogara to step aside to allow a thorough external investigation. In a statement issued yesterday by its executive director, Adetokunbo Mumuni, SERAP insisted that: “Budget padding in fact is corruption, as it is implicit in corruption offences such as abuse of office, attempt to embezzle, divert and misappropriate public funds, conspiracy to act corruptly, and illicit enrichment, which are recognised under the UN Convention against Corruption.